This 16-foot high-speed HDMI cable creates a pure digital connection between HDMI-enabled HDTV display devices and HDMI-enabled digital video sources. 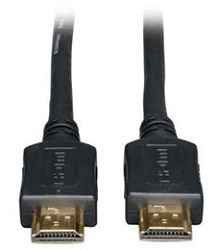 Gold-plated connectors provide optimal signal transfer for higher quality. Premium Double-Shielded HDMI compliant cable protects against outside noise. Impedance matched twisted pair construction reduces cross-talk and interference. Cable supports ultra high-definition (UHD) 4K x 2K video resolutions up to 3840 x 2160.